ladies and gentlewomen, the sandals of the season. if you're like me, and prefer to spend less on sandals but still want them to be stylishly versatile and designed with all-day-walkable comfort in mind, then these babies will be your go-tos this spring and summer. these Sam Edelmans were a big hit in the blogosphere last year, and i can attest that they are indeed worthy of the hype. they look more expensive than they are, have a low metallic heel for just the right amount of lift, and are very, very comfortable (soft straps that stay put, cushioned cork footbed, decent arch support). the perfect sandals – found! 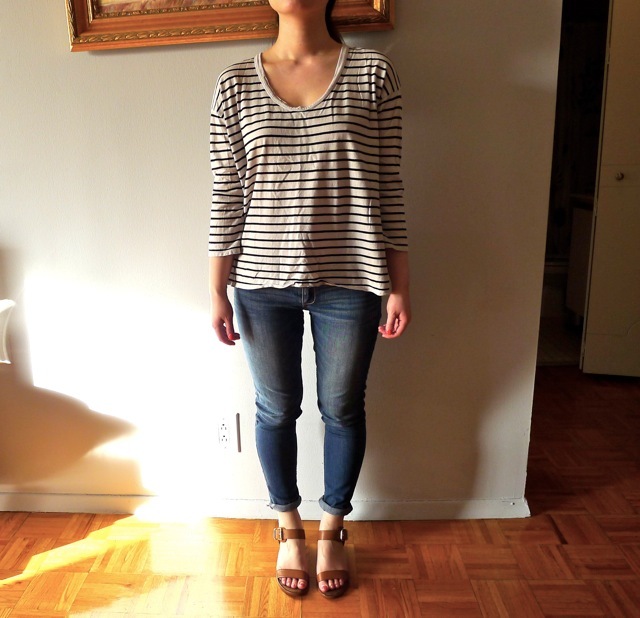 wearing with my favorite Hope breton tee and c/e jeans. also love these in more colors and in leopard. fit-wise, they are true-to-size. style-wise, they are ever so A.P.C./Chloe-esque. price-wise, well, honestly i'm inclined to spring for a few pairs just because i know i'll be wearing them all the time for seasons to come. i'm actually quite impressed by the quality – the leather straps are nice and thick, and the shoe has a nice, solid weight to it. the low gold heel means that they're dressy enough for day-to-night. these are also versatile enough to be the all-purpose sandals i'd pack for travel. i love that they come with a thick rubber heel cap. great traction and ready to wear right out of the box. what do you think? do you have these? Yes, i most definitely love them too :). I'm actually just about to order similar one's from Clarks! ive never heard of them (ahhhh where have i been) and i looked them up at zappos. are the prices missing a zero?? holy cow they're affordable. the pair you've got is so nice! i have my greek sandals so im all set for a long time to come, but otherwise i would be happy to get these too. hehe i think what makes the difference is the small heel. it really 'makes' the shoe IMO. it's been a while since i've found a shoe that is so all-around-perfect. I have just bought them after reading your post. They look absolutely gorgeous. Perfect height, classic, and understated. I hope these last longer than a summer! All of my sandals have fallen apart after a season, although I must admit, they were definitely on the cheaper side oops. cool! from everyone else's comments here they def seem to be very sturdy and long-lasting! I missed out on them last year and I loved the tan version. This year, I'm a little sold on the ivory and silver pair. But I'm not sure I can pull the trigger as I bought a pair of similar looking but flat sandals last year and I'm afraid that one pair will definitely be made redundant and that just won't do. Decisions, decisions. They are great! I got 2 pairs of the flats last year and want to add the tan and snakeskin for this year - love exotics! They still look new after a whole Summer holiday of wear (away from UK of course!) so yes, great quality for the price - I was so happy to find them available in UK. that is SO good to hear. i've never bought any other SE shoes but these are definitely a holy grail find. They are lovely - I spend the summer in Saltwater sandals and insist on wearing the to all but the smartest of events, so a dressier but comfortable sandal would be really useful. I'll keep them on my radar! i also didn't have any really dressy yet comfy sandals until i found these. but now i realize they go with EVERYthing, and the metallic heel is just so perfect. I bought these a month ago and am just wearing them today. They are amazingly comfortable! I bought a pair and raved about them last year. They're so comfy and such good value for money. I purchased these last year and I can also attest that they are the most comfortable heeled sandals ever. I wore them the whole summer and they still look great, and felt great throughout. :) Excellent purchase! that's what i love to hear! :) i feel like these almost put my more expensive sandals to shame haha! I bought them last year because of all the hype, and I must say they live up the hype. Practical and chic and anonymous-looking enough to not look like too trendy an item. I still prefer my flat sandals but I like these for work. I like the yellow pair! so so true. i loved the way you styled yours in your post! Which ones are you wearing in the first photo? Are those the neon yellow ones? How does the light-coloured leather wear? Ammu -ha! that's the mark of a perfect shoe - you can't stop wearing them! totally inspired by you and lin on this. yep the ones i'm wearing are the beige/yellow. it's actually not a neon as much as a pale yellow, which i like better. the light colored leather seems fine, but you could always spray on a little leather protectant if you're concerned about denim transfer or watermarks. I have them black and I adore them. They're comfy and I find myself pondering over the faux snakeskin ones for this year! I think I may be the ONLY person who can't seem to wear these. I recently bought them to try it out and I think my feet are oddly shaped and not narrow enough near my toes for these shoes! Huge bummer. oh! :P the leather straps are soft enough that i think they might stretch a little with wear. hi! i found your blog a few days ago, and have enjoyed going through every single post - i love your style and your writing! 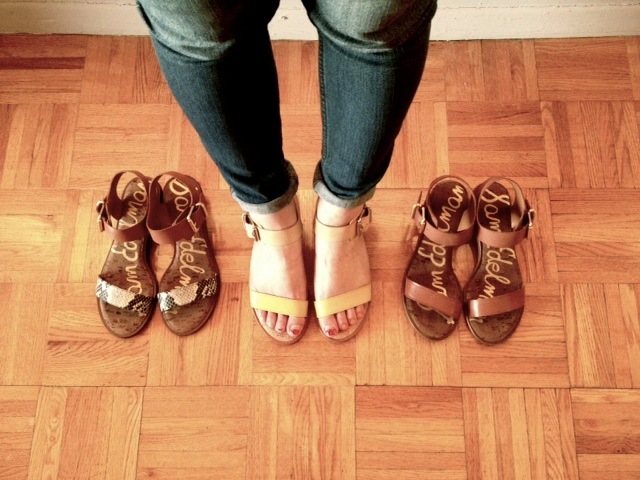 as for these sandals, they are absolutely beautiful and I am seriously considering ordering a pair! I know you said they fit true-to-size-- I generally wear a size 5.5 - size 6 depending on the style and designer. based on this would you recommend i size lower or higher? I would appreciate your advice! hi elly! wow, thanks for being so sweet! :D it really means so much to hear this from my readers! i'm a 6.5 usually and i'd say definitely go with your 5.5. these run very true. let me know which color(s) you end up getting! Goo to see these on your blog! I have them in black (from last year) and tan (just bought them when they restocked). I must say I prefer them to the gigi. I agree they look so apc but the leather is much softer and no breaking in needed. i WISH i got them in the black last year. i hope SE reissues that color soon! hi Hannah! so good to hear from you, please do comment more often! Great sandals! I love how Stella McCartney-ish they look and they are far more affordable than the APC wedges I was planning to buy. Considering the duration of summer, these would be a more reasonable footwear option. I rely on my K Jacques, rondinis and my handmade greek sandals. I love handmade sandals and oftentimes bring them back from my travels. I probably have more than I should. Your sandals look great! Thank you for reviewing these. On more than one occasion I've almost bought these sandals in whiskey, but got distracted. Also on one of the sites they mentioned that they contained man made materials, which made me hesitate. But all of the blog reviews I've read have been positive. So maybe I should pull the trigger. Thanks you both for the detailed responses. I know that's why I've been hesitating. That and my crazy narrow feet. I never know what will work till I try. I love the whiskey color. When are we meeting up in NYC?! i just received my pair in the mail today! I ordered the 5.5 like you suggested, and they fit perfectly. Thank you for introducing me to these shoes - i love them! these sandals last year but couldn't since my size had been sold out. brought this style back. Thanks again! I love the look of these! How high is the heel?